This week our church is sending out the Annual Contribution Statements to our 2014 contributors & church members. This is part of a healthy Stewardship System designed to make disciples that are generous givers to the kingdom ministry that is their local church. A contribution statement is a simple report of the households giving to the church & its ministries over the previous year. Many churches do this on a quarterly basis as well. Our statements include a letter from one of the leadership team (2014 Contribution Letter) as well as an offering envelope. We’ve also included the annual church budget in the packet before. It’s a great reminder of the responsibility we have as disciples to be good stewards. Check out this years Contribution Letter from our church. Provide a variety of avenues for giving to your church. Online Giving, Bank Draft, ACH Online Bill Bay, Sunday Morning Offering Box/Basket/Plate, Offering Envelopes. With people attending church less often than ever before, offering more than just the Sunday Morning Offering time for people to give is necessary. Use an Offering Counting Sheet to record each weeks offerings. At least two people should count, and the planter/pastor should be one of them only in case of grave emergency. When possible a third person should make the deposit. Integrity in counting & depositing boils down to a solid paper trail that tracks every cent. A counting sheet is the best tool for this. Get a good cloud-based Church Management System & input the data from each counting sheet every week. Popular ones are Fellowship One, The City, ACS, Church Community Builder. These can be costly but worth it. You sponsor church may allow you to use theirs for awhile. A good CMS is an important time saver for your Stewardship System because it allows for quick printing on Contribution statements & mailing labels to deliver them. Teach that good stewardship of God’s gifts & resources (time, talent, treasure, property, etc.) is part of being a follower of Christ. Paul told the disciples at Corinth, “I don’t want what you have–I want you” (2 Corinthians 12:14). The Stewardship System shouldn’t just be about the needs of the church budget, but it should be about discipleship. As people become more like Christ, they should become more generous & live by kingdom principles in spending. This probably will positively effect the church budget, but that should be secondary to our desire for people to live like Christ. Model generosity & good stewardship as a leader & as a church. “You won’t be able to lead anyone somewhere that you’re not willing to go yourself.” The Church Planter/Pastor should lead the way as a faithful, generous steward. And the church should model generosity through regular missions giving & radical generosity in the community. Recently read: “If a person is self-focused, we call them selfish. If a church is self-focused, we call it normal.” via @cnieuwhof. We should model what we want others to become. 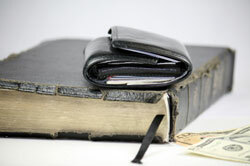 Report regularly & transparently to the congregation through individual contribution statements & church budget reports. Contribution Statements & Budget Reports can serve as report cards for Disciples & Churches on the journey to Christ likeness. What else would you include as part of a churches Stewardship System? Posted on January 20, 2015, in Church, Church Planting, Discipleship, Leadership and tagged church budget, Church Management System, Church Planting, local church, stewardship, Stewardship System. Bookmark the permalink. 2 Comments.